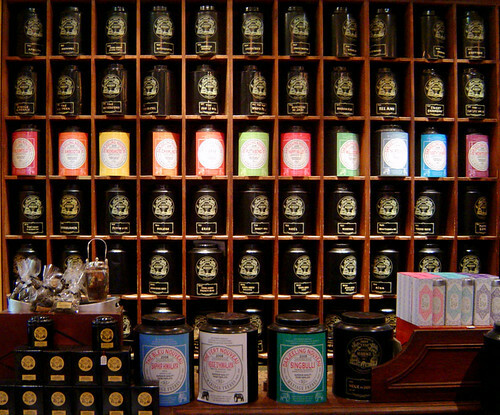 Mariage Frères, purveyors of Tea, originally uploaded by maralina!. Although tea and perfume both have a deep connection in the history of mankind through medicine, rituals and the magical species in the plant kingdom, it was not until recently that tea made its way as a note into perfumery. Both tea and perfume are art forms and ancient rituals that take place in time: the many aspects of tea take place in time. Time is of essence in every aspect of tea: The art of growing, harvesting and processing the tea (i.e. : fermentation, oxidation, roasting, etc.) and than of course the preparation for brewing a cup of tea – waiting for the water to reach the ideal temperature, steeping the tea, and finally, sipping it in perfect harmony with the leaf, oneself and the company involved. Perfume also requires time for preparing the raw materials (growing, harvesting, and distillation or extraction) and than there maturation – the magic that happens in the beaker when all the molecules connect and mingle and marry. It takes time to make a good perfume, not to mention the planning that goes into it on behalf of the perfumer who designs it (and the same goes for the ancient wisdom that evolved into the sophisticated tea cultures we can see today). But more than that, perfume also changes over time. From the moment it escapes the bottle and lands on one’s skin, it morphs into at least 3 different stages, most commonly known as head notes, heart notes and base notes. And the pace and exact evolution that occurs on one’s skin makes each perfume a unique, unmatched experience. Similarly in tea, there are different stages at which the tea can be enjoyed – the dry leaf or blend, before it has been brewed; the aroma of the brewed tea as it rises with steam from the cup, than the way it tastes in one’s mouth, and finally – the aftertaste that is left behind, usually at the back of the palette or the throat. My friend and tea master Dawna Ehman pointed out to me that these stages are very similar to the top, heart and base notes in perfume. Perfumed tea is a term known mostly to true perfume connoisseurs and it’s a very ancient term in tea culture and is the ancient art of perfuming tea with fresh living flowers or plant matter. For example: rose congou is achieved by layering rose petals among black China tea. The process is very similar to enfleurage, only it is tea leaves that soak the fragrance of the flowers, rather than animal fat. Thousands of petals of Jasmine Sambac are layered between tea leaves and are replaced by new ones until the green tea achieves its distinct aroma. And a similar process creates other more rare floral teas such as magnolia oolong or pomelo blossom green tea (the one used in Charisma). And while perfume made its way into tea thousands of years ago, it is strange perhaps that it’s only in the past 15 years or so that the one can hear of the notion of tea within a perfume composition. Why? We said it earlier: tea is subtle. And so is tea absolute (both green and black). It doesn’t give the hit that an essential oil of grapefruit would have, for example. It really is not that impressive raw material. My guess is that tea really needs the chemistry that water gives it to open up. And so it is not really surprising to find that tea as a note did not make it to perfumery until the early 90’s. The 90’s were marked by the craving of fresh, clean, gender-neutral scents. At the same time, as is usually the case with trends, it all starts with a fad of one innovative individual who’s either stubborn to death or very intuitive about what everyone else is secretly craving. In the world of perfume, that person happened to be Jean-Claude Ellena. The story goes that he had the idea for a “tea” scent for a few years before it finally got accepted as a perfume by the jewelry house of Bvlgari. The inspiration was none other than Mariage Frères shop in Paris – a tea shop that even I can attest to its magic as an olfactoroy experience alone. They seem to have hundreds of different kinds of tea, and the atmosphere there is pensive as if time stops once you’re in. Monsieur Ellena did not try to capture the real-life aroma of tea, nor did he want to brew any specific type of tea. He created the abstract suggestion of un-steeped tea leaves by pairing two molecules: hedione (a component in Jasmine) and ionone (a component in Violet Leaf). And voila – he made tea. The only problem was that no one was interested in it as a commercial product, perhaps it seemed to avant-garde, or simple or strange; until the house of Bvlgari commissioned him to make a perfume to scent their shop, which became a perfume, which became very popular. And from than on, tea has become the craze of the 90’s and early millennium – as part of the trend for fresh, light, inoffensive, unisex, non-perfumey fragrances. The copycats of Bvlgari’s Eau Parfumee au The Vert (that was the name of the perfume when it was finally released to the public, not just the Bvlgari jewelry boutique customers) are too many to count, but among the most significant and successful of them, we must mention Elizabeth Arden’s Green Tea (1999, by Francis Kurdjian). Later on, other types of tea entered the perfume counters: Lapsang Suchong in Bvlgari Black and l’Artisan Parfumeur Tea for Two (2000, Olivia Giacobetti), the South American Mate (Villorsei’s Yerbamate, 2001), and most lately rooibos tea notes in Eau Parfumee au The Rouge for Bvlgari (and my own Immortelle l’Amour). Tomorrow: natural raw materials with tea or tea-like notes. Gosto muito do acento de chá com madeiras de Au The Rouge by Bvlgari. L'Amour de Immortelle segue esta linha? É uma composição com madeiras também?